Corrugated iron hut on grassland next to Turtons Stream, south of Lake Coleridge. Constructed in 1957, restored in 2008, and reportedly in good condition. The original hut was built in 1897, and is still standing. Alfred Comyns was a local musterer. 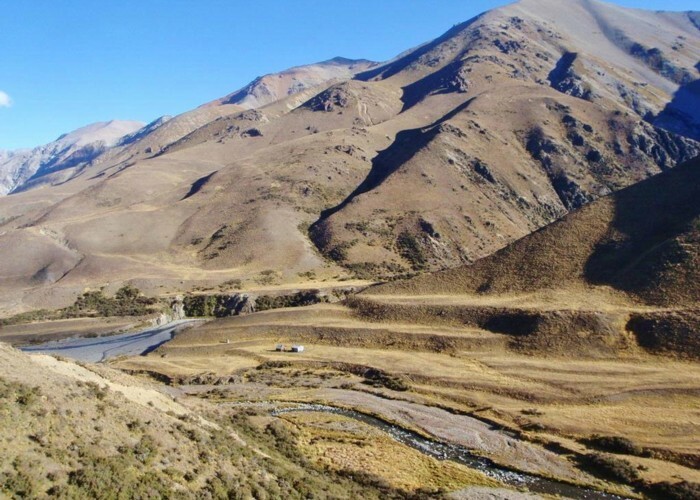 In 1897, he drove a flock over Mathias Pass (1458m) to graze the headwaters of the Hokitika River. All 2000 sheep died. A chapter is devoted to Comyns Hut in Mark Pickerings, "Huts: untold stories from back-country New Zealand." Comyns Hut in the upper North Ashburton River • By lewshaw. Licence: cc by-nc-nd. Marked track up Glenrock Stream from the road up the true right of the Rakaia River, 4-5 hours. Added 8 December 2012 by MatthewMatthew. 3 revisions, most recently 27 July 2013 by MatthewMatthew.